Danish rights to Minna Lindgren’s Death in Twilight Grove sold to Jensen & Dalgaard! We are very happy to announce that Jensen & Dalgaard, publisher of acclaimed and award-winning authors such as Katri Lipson, Diego Marani and Robert Louis Stevenson, has acquired Danish rights to Minna Lindgren’s Death in Twilight Grove (Teos 2013), Part I in the Twilight Grove Trilogy. 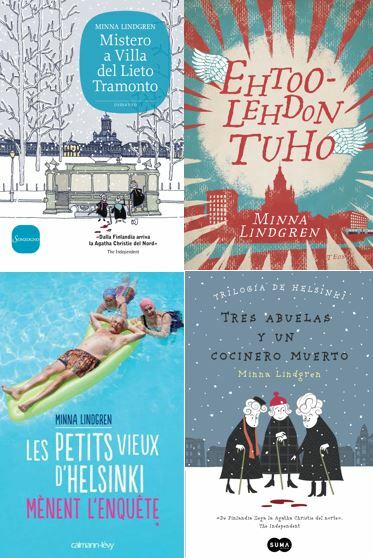 Also comprising Escape from Twilight Grove (Teos 2014) and The End of Twilight Grove (Teos 2015), Lindgren’s sharp, humorous and socially conscious trilogy set in and around a Helsinki retirement home follows the adventures of three bright, spirited and inquisitive 90-something ladies. The conclusion to the trilogy, The End of Twilight Grove, was published in Finland in late April and immediately jumped to local bestseller lists. Book II, Escape from Twilight Grove, was nominated for the prestigious Runeberg Prize last year. This spring Death in Twilight Grove has been published in Estonia by Varrak, in France by Calmann-Lévy, in Italy by Marsilio and in Spain by Suma de Letras /Penguin Random House. In Death in Twilight Grove (Teos 2013), Siiri, Irma and Anna-Liisa discover that their home, a Helsinki retirement community called Twilight Grove, is an optimal environment for both smaller swindles and larger criminal activities. The second entry, Escape from Twilight Grove (Teos 2014), sees our heroines moving to an apartment in the Hakaniemi neighbourhood as roommates. A fishy plumbing renovation at Twilight Grove evokes suspicions of more crimes taking place, but the real crimes may actually be happening elsewhere. The final part in the trilogy, The End of Twilight Grove (Teos, 2015), marks a return to the retirement community. But the place no longer feels like home, and has turned into a state-funded, technology-driven pilot project in elderly care. The conclusion brings together characters lost along the way, and murky details are brought to light. Legal justice is also served – in unexpected ways. Minna Lindgren (b. 1963) is a freelance journalist and columnist known for her whimsical writing style and fearless approach to topics as strange as opera and death. In addition to novels, she has authored nonfiction books on classical music. In 2009 Lindgren won the Bonnier Journalism Prize for her article entitled “Father’s Death” (“Isän kuolema”). The fictional Death in Sunset Grove (Kuolema Ehtoolehdossa, Teos 2013) and Escape from Sunset Grove (Ehtoolehdon pakolaiset, Teos 2014) are the first two entries of a mystery trilogy that takes a sharp and satirical look at life inside a retirement home. Both books have been critical and commercial successes, and well-known British-born Finnish director Neil Hardwick is currently working on a film adaptation. If you enjoy the whodunits of Miss Marple, the sharp quips of Downton Abbey or the playfulness of the bestsellingThe 100-Year-Old Man Who Climbed out of the Window and Disappeared, you will fall in love with The Sunset Grove Trilogy. 07.08.2018 New reviews and new agents! 16.06.2016 Norstedts acquires Swedish rights to Death in Sunset Grove by Minna Lindgren! 01.04.2016 Minna Lindgren’s Death in Sunset Grove sold to Slovakia – and getting rave reviews in Germany! 20.07.2015 Minna Lindgren’s Twilight Grove Trilogy is an international hit! 17.06.2015 Book III in Minna Lindgren’s Twilight Grove Trilogy is a commercial and critical hit! 08.06.2015 Danish rights to Minna Lindgren’s Death in Twilight Grove sold to Jensen & Dalgaard! 18.02.2015 International editions launch for Minna Lindgren’s Twilight Grove Trilogy! 15.12.2014 Minna Lindgren’s Escape From Twilight Grove nominated for the Runeberg Prize! 09.09.2014 Minna Lindgren’s Twilight Grove Trilogy sold in the Czech Republic!